Punta de Mita is a beautiful resort area that offers a luxurious vacation experience away from the crowds and the cities, along with the opportunity to enjoy many different activities around the city. Not only is the climate here ideal for this particular sport, but it also has two beautiful golf courses to choose from. The green next to the Four Seasons resort in Punta de Mita is one of the best in Mexico. There are two different golf greens in Four Seasons Resort Punta de Mita, the Bay Golf Green and the Pacific Golf Green. The Pacific Golf Course was designed by the legendary Jack Nicklaus and was inaugurated in 1999, and it’s bordered by white-sand beaches, and the majestic mountains of the Sierra Madre that surround Rivera Maya. This course extends for 200 acres, making the most out of its proximity to the Pacific Ocean. From this beautiful golf green you can see the whales crossing the ocean during the migration season. The Pacifico counts with eight holes directly facing or playing alongside the Pacific Ocean, and hole 13 runs along a quiet lagoon. It also features the new and challenging hole 3B, also known as “Tail of the Whale”. It also happens to be the only green of the world that is located in a natural island, allowing for a beautiful weather and view of the ocean. The surrounding palms and flower-covered trees accentuate the beauty and pleasure of playing in this golf camp, that both, represents a challenge for experienced golfers, and a great place for beginners to practice. In total, this camp counts with 18 holes and an additional par-three hole. This Golf Course is highly praised by golfers and golfing magazines, and it inspired Conde Nast Traveler readers in 2006 and 2008 to select the Four Seasons Punta de Mita as the world’s #1 golf resort. The course may be played from 5,037 yards up to 7,014 yards with a choice of five sets of tees. The first tee time is 7:30 am, and tee times are available at 10-minute intervals. 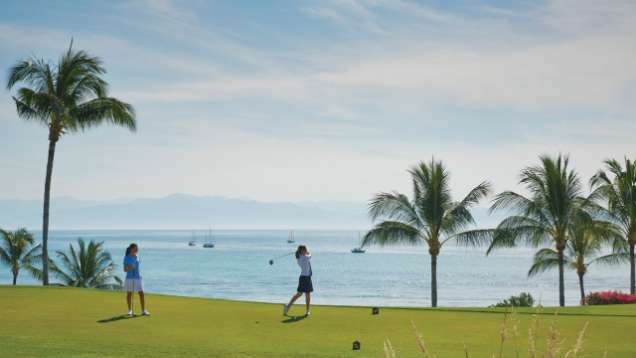 The other golf course, called Bay Golf Course was also designed by Jack Nicklaus, making it his second Championship Course in Punta de Mita, and offers beautiful lakes and ponds, some of them snaking their way through the holes. The combination of Nicklaus’ design and the natural beauty of the location, make this golf course as stunning as its sister course. The Bay Golf Course is more recent than the Pacific Golf Course, since it was inagurated in 2009, ten years after the first golf course was inagurated. On contrast to the original green, this one offers fairways, making the putting technique a very important part of the game. Just like the original camp, this one has 18 holes, six of which are ocean holes. The chalenging and undulating fairway and green complexes offer a wonderful counterpart to Pacifico for golf afficionados. Both courses also offer the opportunity to take golf lessons, and have a beautiful Pro Shop you can visit any time you want from 7 a.m. to 7:30 p.m. The Pro Shop offers clothing for both, men and ladies, along with some equipment. Shuttle service is available at all times to pick up and from off golfers who are within 10 minutes drive of the Resort. This private Punta de Mita Golf Club is open only to Punta de Mita property owners and their guests, and guests of Four Seasons and St. Regis Resorts. It has ranging princes for peak season (November 1st. – May 31st. )that go from 240 USD for 18 holes to 155 USD for 9 holes, and, finally, 50 USD for guests younger than twelve year olds. On off-peak season (June 1st – October 31st. ), prices go from 195 USD for 18 holes to 130 USD for 9 holes. Four Seasons’ golf course also offers a practice camp for all ages for only 25 USD, and the option to rent golf clubs and Nike sneakers. Multiple rounds are available by paying the replay fee of 60 USD for 9 or 18 holes. All prices include Pinnacle balls, a golf cart, golf clubs, and a guide. As you can see you have several options to chose from when coming to Punta de Mita. Our hotel is less than five minutes away from the closest course and we’ll be happy to organize a day of golfing for you during your stay. Simply speak with our concierge and he’ll be happy to set up everything for you! Subscribe to our monthly newsletter and enjoy 2 hours of SUP surfing during your stay!